archer Philoctetes led a group of seven ships with 50 warriors each. In book XIII, line 332, of the Illiad there is a quote that seems to relate to the state of roads at the time of HOmer: “And as gusts come thick and fast when shrill winds are blowing, on a day when dust lies thickest on the roads, and the winds raise up confusedly a great cloud of dust.” When the rains came such a road would be a sea of mud. At the end of Book II of the Odyssey , Homer describes the trip by ship that Telemachus takes to Pylos, “So all night long and through the dawn the ship cleft her way.” The trip took all night or about 11 hours for a distance of about 110 miles. This means that the ship traveled at about 10 miles an hour. This speed was possible because “Athene sent them a favorable gale.” It is significant that the trip is a night because it could then be guided by the stars. The two passengers and twenty oarsman probably slept while the helmsman navigated the ship. In book III of the Odyssey Nestor describes the return trip of Diomedes from Troy to Argos. The stops included Troy, Tenedos, Lesbos, Geraestus, and then Argos. This was accomplished in four days. The trip was about 295 miles and took approximately 48 hours. This works out to about 6 miles per hour. The ship could have sailed faster to make up for overnight stops but the trip across the Aegean sea, from Lesbos to Geraestus, probably occurred at night so the helmsman could use the stars for navigation. Homer states “In the night they reached Geraestus”. At the end of Book III of Odyssey Telemachus is described as traveling from Pylos to Sparta in a chariot drawn by horses. The first day the chariot travels from Pylos to Pherae all day for a distance of 41 kilometers. This relults in a speed of 41/12 = 3.42 km/hr. The second leg of this trip from Pherae to Sparta was a distance of 29 km and took 12 hours. This results in a speed of 29/12 = 2.42 km/hour. This is well below the recognized speed of horses of about 17 km/hr for distances up to 160 km. In fact the men could almost walk that fast. This route is marked out as an ancient route in a map titled “Route in Lakonia and Messenia” page 186 in Sparta and Lakonia by Paul Cartledge. On page 339 he states that “There is … nothing to disprove the suggestion that the alleged chariot-route over Taygetos taken … by Odysseus’ son Telemachos when he came to visit Meneleos at Sparte (is fictional). This is in spite of Homers description of Sparta as “lying low among the caverened hills, and drave to the dwelling of renowned Meneleus. Carteledge is mainly concerned that the remains of the palace of Meneleus has not been found. 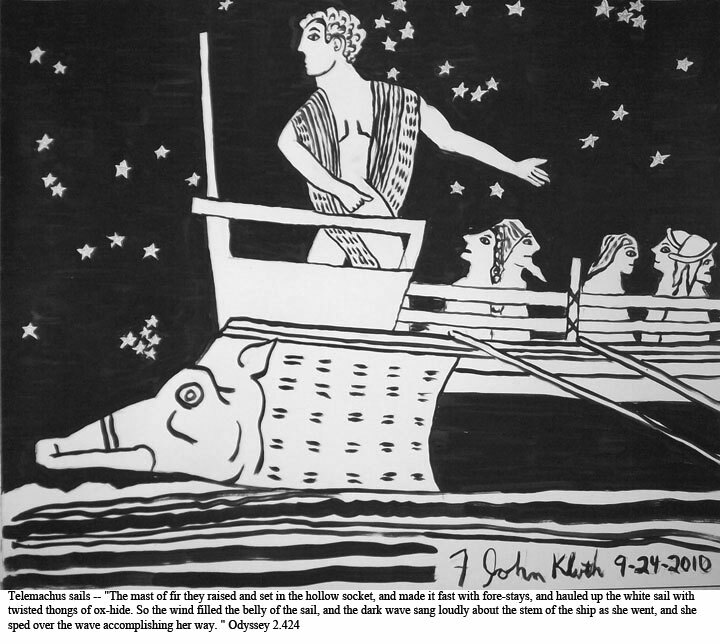 In Book IV of Odyssey , line269 there is an example of celestial navigation, “Gladly then did goodly Odysseus spread his sail to the breeze;  and he sat and guided his raft skilfully with the steering-oar, nor did sleep fall upon his eyelids, as he watched the Pleiads, and late-setting Bootes, and the Bear, which men also call the Wain, which ever circles where it is and watches Orion,  and alone has no part in the baths of Ocean. For this star Calypso, the beautiful goddess, had bidden him to keep on the left hand as he sailed over the sea. For seventeen days then he sailed over the sea, and on the eighteenth appeared the shadowy mountains  of the land of the Phaeacians”. It seems unlikely that Odysseus sailed 18 days without sleeping day and night. There is really no space in the Mediterranean big enough anyway. At least we can interpret the direction as East. Rodney Castleden, in his book “Mycenaens” refers to the litter or palanquin as a form of transportation in Mycenaean times. (pp. 34) He says the Minoan use of litters inspired the Mycenaeans. The advantage of the litter is that no more than a path is required and in many cases in Greece that is all there was. The litter is essentially a frame on a pole so that two persons can carry a third person. the simplicity of the contrivance.” Xenephon “Hellenica” Book 4. Xenephon mentions a number of roads along which armies proceed but there is little indication that they are even suitable for carts. Carts had both spoked wheels and solid wheels. The difference between a cart and a chariot is subtle. Both are two wheeled conveyences. The chariot was light and built for speed. The cart would have been heavy and strong. China ships were modeled after swimming ducks and were even made to look like them. that sea were inviting crystal clear waters and green islands that could be seen from shore. after the dugout canoe. But a sailing ship was also developed along different lines. considered of the sending of Odysseus, the great-hearted. together, and then made all fast with trenails and dowels. raft with levers down to the fair salt sea. A major innovations in transportation was the trireme ship. world and make the Mediterranean safe for their shipping. had two banks of oars on each side. Triremes had three banks of oars. there were basically two kinds of ships: oared galleys and round ships with sails. that is high at the bow and the stern and slops downward to the beam of the ship. fitted with rams but galleys always were. Most navigation was in terms of landmarks on shore. But when the ship was out of sight of land the stars were used. Some crossings hand to be by night for this reason. There are a number of references in the literature to helmsmen who stood at the helm while other slept. This raises the issue of sleeping accomodations and helmsman visibility. Some illustrations show a tent like structure covering the center of the ship. Perhaps this structure contained sleeping accomodations? Would the captain have a tent cabin. And finally, would the helmsman have to be raised above all this to have good visibility. At least at night he would have to see the talking post, as the ancient Greeks called it, the bow post that would indicate the direction of the ship. Notice that in the ancient ships both the bow and stern posts are prominent. Launched the light bark, and gave her to the main. Within the harbour, work'd its easy way. “Now when we reached thy docks well walled, we began to launch the fastest of Sidonian ships, with her full complement of 50 rowers, and each task in due succession followed; some set up the mast, others ranged the oars with their blades ready, and stored the white sails within the hold, and the rudder was let down astern and fastened securely…the bull refused to go forward along the gangway…cast him into the hold… And Menelaus stroked the horse on the neck and brow coaxing it to go aboard. At length, when the ship was fully freighted, Helen climbed the ladder with graceful step and took her seat midway betwixt the rowers’ benches… and the billows were soon echoing to the rowers’ song, as we heard the botswains note. (a battle ensues on the boat) Then did the prince set himself to steer, and bade them make a straight course to Hellas. So they set up the mast, and favouring breezes blew; and they are clear away. …the trimming of its sail, its side-guards, and the prow that with its eyes scans its onward course, obeying—all too well for those to whom it is unfriendly—the guiding rudder at the stern. The men on board are plainly seen, their black  limbs showing from their white attire. The rest of the ships and all the assisting fleet stand clear in view: but the leading ship herself has furled her sail and draws near the shore with full sweep of sounding oars. it might not take that many amphora to make a trip of such a ship worth while. hold of the ship would be layed with brush and the point of the amphora would be set in the brush. This would provide support for the cargo so it would not shift. But there is another possibility. Sailing ships were convenient because they had spars overhead. They could be used with a block and tackle to easily lift heavy loads from the dock to the hold. I am thinking that the amphora could be picked up easily by a rope around the point. I will have to experiment with this when the model is that far along. Studies – Customs, Traditions, Anthropology. Ancient chariot from the estate of Roma Vecchia, 550-540 BC, Vatican museum. Xenophon(400 BCE) – Marched an Army through Persia. Alexander the Great (Megas Alexandros, July 356 BCE – June 11, 323 BCE), – Marched an Army to the Indus River. Pytheas of Massalia(330 BCE) – Sailed to the British Isles and almost to Greenland. Mycenaean and Minoan civilizations c. 2000 B.C. 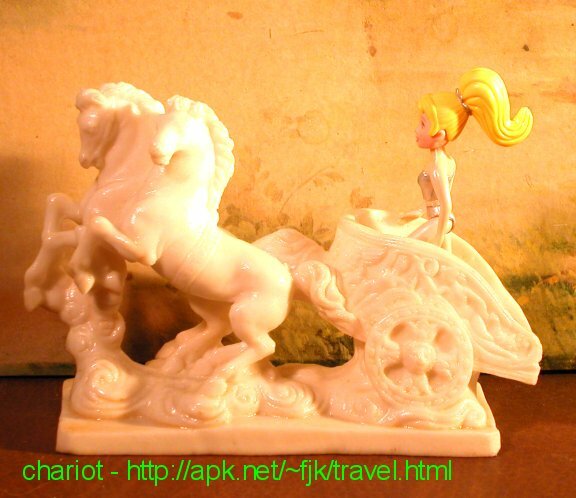 Answer: Goddesses have chariots to carry them through the sky. Question: how did the ancient greeks get transported. carts. Later horses were ridden with a saddle. Question: Where would the people of ancient Greece travel to? were within sight of land. the mosaic of Alexander the Great shows him with a sadle. Question: Did the Ancinet Greeks have roads? If so, when were they created? find any information regarding hospitality among travelers in Ancient Greece? Answer: The Argonautica by Appolonius of Rhodes is about an ancient Travel. Herodotus is a famous traveler. Xenophon writes about Traveling in the Anabasis. Telemachus travels to Sparta in the Odyssey. Question: How did ancient Greeks travel on land? Answer: The ancient Greeks either walked, marched, or rode in a chariot. a tem of any of these. Question: What means did ancient Greeks use for transportation? Answer: Click on the menu derectory below then click on architecture. transportation then in greece and here now? Answer: A poor Greek could only travel where a rich Greek wanted him to go. Answer: Usually travel was done in groups for safety. were primarily rowed but did carry sails. The galleys were rowed with oars. banks of oars on each side. Triremes had three banks of oars. Question: what was the main source of travel? Answer: Sailing ships were the life blood of ancient Greece. Question: Did the Romans attend the Olympics in Greece? Answer: not during the Greek period. But they did during the Roman period. Answer: You would have booked passage on a sailing ship. Question: How did kings travel? Question: where did the trveler that went to athens stayed? operated the same way. Houses of prostitution operated this way as well. market to sell their wares. Answer: Horses were not used to draw carriages in ancient Greece. would deliver a message as fast as possible. Question: How did the ancient greek men travel if by land? In a chariot drawn by horses, two or four. In a two wheeled ox cart. of transportation were poorly developed. Answer: Most slaves were transported by ship. Question: What kind of stuff did the ancient Greeks trade? Answer: The ancient Greeks were great traders, especially on the sea. Question: how did slaves travel? naked they might not escape so easily. University Press, Baltimore, 1994, ISBN 0-8018-4808-3.
other children dancing the Crane dance to celebrate his victory. Question: How did the women travel in ancient greece? inclement weather the ship would find a safe harbor and weather the storm. Question: What did people use to pay for travel in Ancient Greece? barter, such as a quantity of grain or an animal. Question: How many people fit in a chariot? Answer: Normally two, but more can squeeze in. Question: how did the greeks travel from city to city? the cities were not in good condition and could be difficult in bad weather. But messengers commonly moved between the cities by running. might make only 50 – 100 miles a day. The safe trip might take 20 days. Question: I am doing an assignment for a class and I have to have a map of greece that relates to the time of the goddesses in greece. I need a map of greece and a map of Mt. Olympus. Do you have any suggestions. Answer:Map of ancient greece with Mt Olympus. Photo of Mt. Olympus from space. Question: how did Greece’s geography affect their development? Answer: Greece has a pleasant climate with green isles set in an azure sea. These islands stimulated boatbuilding and exploration. This stimulated trade and commerce with other nations and an exchange of information. The rocky nature and poor soils favored the gorwth of olives and grapes which could be easily preserved. The resulting products, olives and wines were easy exports as was wool that sheep produced on the rocky soil. The trade and commerce stimulated manufactured goods such as woven cloth and pottery. Finally minerals such as silver were discoved in the rocky soil which greatly enriched the inhabitants of Greece. Athens be different than the route there? Answer: First you must understand that such a trip would be very dependent upon the season and the weather. The distance is about 160 miles. A sailing ship speed might be 2-10 miles per hour. Under the same conditions an oared vessel would be able to add 2 – 3 miles per hour. Such a trip might take one, two or three or more days days. Most vessels would follow the coast of Greece and then travel to Crete from Kythera. In between Kythera and Crete is a small Island Antikythera. This island provides line of sight navigation on this route. Another route to Crete would involve a trip through the Cyclades to Karpathos and then to Crete and this trip is much longer. These ships would travel during the day and stop at night. The other option is to sail directly from Athens at night. On a clear night with a wind one could sail directly from Athens to Crete. In this case instead of using line of sight navigation, one could use the stars. This would take a lot more skill. Because such a trip would take longer that 12 hours the trip might go to an island like Milos and then to Crete. On Milos the ship would stop during the day instead of at night. Odysseus sailed during the day when he was sailing his own vessel but he traveled at night when he left from Phacia to Ithaca. It is unlikely that an oared vessel would undertake a journey of more than a few hours because rowing takes a lot of effort. So in the long run the sailing time would be used. The pictures on ancient pottery invariably show oared vessels. But this is just because they were more dramatic. Sailing vessels were more common and oars were rarely used on those that had them. Archaeologists have rarely found oared vessels, and the fact that sailing vessels have been found far out to sea suggests that night navigation was fairly common even at the time of the Trojan war. Question: Why Did Greeks Travel?? Answer: Initially Greeks traveled to find new and better homes. But early on they found the advantages of trade. Later some Greeks moved to help with Trade. Greeks traveled to be mercenaries. Greeks traveled to participate in sports events. Greeks traveled to consult oracles. Greeks traveled to find out the truth of reports as Herodotus states “I, Herodotus of Helicarnassus, am here setting forth my history, that time may not draw the color from what man has brought into being, nor those great and wonderful deeds, manifested by both Greeks and Barbarians, fail of their report, and, together with all this, the reason why they fought one another.” Greeks also traveled both to teach and to learn. Greeks traveled to fight in wars. Question: How long did it take to sail from Greece to Rome for trading? Which port cities were most often used between Greece and Italy? One ancient sailing trip was taken by Telamachus and documented early in the Odyssey of Homer at the end of book III. His vessel sailed overnight from Ithaca to Pylos a distance of about 118 miles. If overnight is taken to be 11 hours then the rate of the vessel was 10.7 miles per hour. Ancient Greek ships did not travel to Rome. Rather they went to Pithecusa (Ancient Ischia, near Naples) where their wares were unloaded and transferred to Etruscan vessels. The trip to Pithecusia would most likely begin at Corinth and proceed through the gulf of Corinth to the Ionian Sea up along the west coast of Greece. at Corcyra(Corfu) the ships would direct their prows to the open sea to the northwest. This trip over the open sea would be made a night so navigation could be made by the stars. A ship might have to wait a while for favorable winds and a clear night to make this journey. The ship then sailed around the heel of Italy to Tarentum or perhaps Croton. The vessel then headed for Rhegion on the toe of the boot of Italy. Finally the ship headed up the west coast of Italy toward Pithecusa. The total trip was about 870 miles involving some 87 hours of sailing time. Many stops were involved because the crew normally slept on the beach. Nine days might be a reasonable estimate for this journey at its best. The speed of a sailing ship is a function of both the wind speed and its length. The speed of the vessel of Telemachus is about the top speed for a vessel of 50 feet. Since the ship had a crew of 20 this is a good estimate for its length. Warships could be larger and travel faster. Merchant ships could also be larger but probably would be slower. There is debate as to whether most ships were sailed or rowed. Rowing would increase the ships speed, but rowing could not be sustained for long. It seems most ships depended upon sails for long distances. Question: How long did it take the Greeks to sail from Greece to Troy during the war? Answer: The sailing distance from Argos to Troy is only about 210 miles. Under good conditions the sailing distance might be only be four days. One has to wonder why the Greek Army was so isolated at Troy if this were the case. Question: When traveling by sea during a storm, would the sails be raised or lowered. If they would be lowered to help with stability, wouldn’t the storms destroy the sails? Answer: The customary practice is to lower sails partway during a storm. Typically a sail has reef strings so that it can be gathered at the spar to reduce the surface exposed to the wind. But in a storm running with the wind is dangerous and can bring the ship against a shore. A better practice is to head into the wind and tack. There is some question as to whether and ancient Greek ship could do this. Today this is done with triangular sails and the leading edge of the sail being the mast. An Arab dhow can do this but the leading edge is a spar. Some square sailed vessels during the time of Spanish exploration had special ropes that stabilized the leading edge of the sail and helped with this. The most likely situation in ancient Greece is that in the storm the sail would be stowed, the crew would be asked to row and the ship would be headed into the wind. The ancient Greeks knew that to be caught at sea in a storm was often a disaster. If the ship was within sight of land one option would be to pull up on shore. There was a sailing season with fewer storms. In spite of all this when the Greeks returned from Troy in their ships there was a fierce storm that drowned many of the warriors. And Menelaus was on one of the ships caught in the storm and his ship ran with the wind and was blown ashore in Egypt where he was stranded for 8 years. Question: What sort of luggage was used by the Greeks? Baskets? Drawstring bags? some kind of sachel? Answer: In ancient Greece leather and cloth bags are used. In the Odyssey Odysseus receives a bag from Aeolous, the god of the winds, this bag is translated as a wallet. Baskets were also used. But things were stored in an amphora when shipped over the water. The amphora is a jar made of clay with two handles and a pointed bottom. There are a number of other styles of jars that were used for other purposes. The hydra was used to carry water. Chests were also used. Danae was cast into the sea with her son Perseus in a wooden chest. The Anima chardonnayis characteristic of all the wines produced in this boutique vineyard. on a 1,000-year journey through a turbulent, exciting and glorious past. It owns 1,185 islands and 66 of them are inhabited. I am wondering, where did the Greeks stay overnight if there wasn’t a port in sight? Would they stay in tents, just roll out mats and sleep on the ground, or would they just keep going?